It’s not very often that the world of boxing crosses over into the world of fashion. (UFC is another matter–and decade–entirely, although I think we can all agree that the person or persons who created the TAPOUT line of apparel can never be forgiven) I did know a pretty fashionable guy who used to wear a pair of boxing gloves when he played guitar, but that was in a joke band plying their trade in a sub-genre they call “noise rock” and so doesn’t count for much at all. Ponys were different; they weren’t just some British Knights-type deal created out of thin air to cash in on the “sneaker craze.” Real boxers wore real Ponys into the ring and sometimes even emerged with real championship belts wrapped around their waists. How much cachet that had among consumers is hard to say. I mean, Converse had Magic and Larry Bird, Reebok had ‘Nique, and of course Nike would soon reel in that young kid down in Chapel Hill who would one day become so famous he’d make a movie with Bugs Bunny. Meanwhile, Pony had the coked-up pugilist/anarchist Leon Spinks–the man who shot Muhammed Ali in an East St. Louis Hardee’s parking lot! The question “Who wore Ponys?” may never be answered. Kids who weren’t too bright? Latchkey kids? Bullies? I personally thought they were cool but never had a pair. I can’t even remember if the big chains like Athlete’s Foot and Foot Locker carried them or if they were relegated to the wire mesh bins of Woolworth and Kmart with the Wilson Batas and Traxx. If you search for “Pony Basketball Shoes” on Google, you get 127 hits. Using Bing brings up just 78 results. Try it with Alta Vista and you get an Error 404 message. 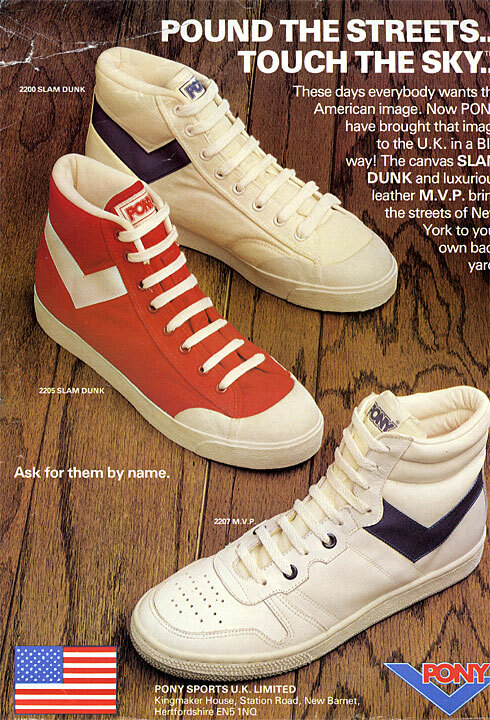 I think these shoes deserve a lot more recognition than that, but we may end up having to rely on the incandescent minds and fearless vision of the hipsters to bestow upon them a proper revival.